In our culture “ethics” means the system of moral values or the principle of right or good conduct. This article traces the root causes of behavior and some of the conditions that determine if the manifesting behavior is ethical or unethical. I will illustrate how adults influence the behaviors of children and discuss some of the elements necessary to insure that children conduct themselves ethically. In order for this secret of childhood to be revealed it is imperative that the adults in children’s lives create beautiful environments that nurture their unfolding spiritual lives as well as their physical, intellectual and emotional lives. When this happens, the amazing seeds hidden within the children’s souls sprout and bloom into beautiful flowers of peace and children exhibit ethical behavior. When environments are not carefully prepared and seeds of anger, fear and distrust are watered, children manifest qualities of aggression and exhibit unethical behavior. Thich Nhat Hanh, a well-known Vietnamese Buddhist Monk, in his book Touching Peace –Practicing the Art of Mindful Living describes this process. He speaks of our consciousness as having two parts: (1) conscious mind and (2) sub conscious mind. The conscious mind is seen as the living room and the sub conscious mind as the basement. Everything we have experienced or perceived is in the form of a seed or film which is stored in the archives of our basement. When these seeds, or film, decide to make themselves visible, we watch them from our living room. At times, these seeds control our behaviors from the basement without our even being conscious of them. We do not have much control over when they show up either consciously or unconsciously. Some of these seeds are based in fear and are uncomfortable and others are based in love and are comfortable to re-experience. The seeds that are stored in our subconscious come from all of our experiences throughout our lives. Negative seeds stem from a variety of activities such as being told we are not capable, being ignored, being misunderstood, seeing aggression, being a victim of violence and being put down by others. If the majority of our experiences are related to negative activities, many seeds of aggression and violence accumulate in our sub conscious and often prompt us to exhibit unethical behavior. The same phenomenon is true of children. When well-meaning parents or teachers, fail to give children adequate attention in the group, children interpret this as the adult telling them they are not important. Because being recognized and included in the group is extremely important to children, seeds of negativity, based on this experience, are planted in their sub conscious. Instead of seeking positive attention by cooperating, the children seek negative attention through disruptive behavior. When children’s basic needs of food, clothing, shelter and safety are not met, they experience many negative feelings such as abandonment, loss, anger, fear and resentment. These seeds of negativity are planted in the sub conscious and often show themselves in unethical behaviors such as stealing, harming and killing others. When children have been ignored and put down by others bigger than they are, seeds of anger, resentment and aggression are planted. Often times, when children are in a position where they are bigger than someone else, those seeds of anger and resentment show up in their conscious mind and they exhibit bullying behavior. When children view violence on television, in movies or in their lives, negative seeds are planted which often develop into aggressive and violent acts in their own lives. As adults, in the lives of children, it is important that we become more aware of the seeds of aggression we may be cultivating in our children’s lives. Of course, all children will experience some negativity in their lives; the important thing is how much, how often and how it is balanced by positive influences. Herein lays the magic of healthy home and classroom environments. Thich Nhat Han describes the process of healing negative seeds by increasing positive seeds through a practice of mindfulness. I believe that this principle is the most effective way of nurturing the positive seeds of potential and goodness within each child. We know that children are beautiful spiritual beings who bring great gifts of potential to the earth. The problem is that they do not necessarily recognize this in themselves. They are at a point in their development that they form their self images from the significant adults in their lives. What we mirror to them, they assume they are. As mentioned earlier in this article, we may inadvertently mirror to them that they are not as important as other people in our lives, that they do not know what they are talking about, or that they are to be seen and not heard. The effect of this is that children identify with these images, plant seeds of negativity and, if there are not more positive seeds than negative seeds planted in their early lives, they will manifest aggressive or other negative behavior. On the other hand, when we consciously see children as the beautiful spiritual beings they are and mirror that light back to them, the seeds of truth and beauty are planted in their sub conscious, and they most often manifest peaceful, ethical behavior. In my book, Honoring the Light of the Child – Activities to Nurture Peaceful Living Skills in Young Children, there are 22 concrete activities that help children recognize their beautiful spirits of love and use it to guide their decisions in life. Maria Montessori spoke to what is required of the adults so they can see the beauty in the children. Our difficulties come from our thinking about the past or the future. When we breathe consciously, we come to the present and “touch peace.” By breathing deeply and consciously we bring greater light and awareness to the moment, we experience greater understanding, we receive clearer messages from our intuition and we make choices from our deep source of wisdom. We can then move from this present moment into the next moment which is still the present when we reach it. Breathe, breathe, breathe—this is mindfulness. The more we practice mindfulness, the more positive seeds of love and kindness we plant in our sub conscious. The stronger our positive seeds become the more we manifest peaceful behavior and model it for the children. The more sensitive we become to the developmental needs of the children the more effectively we prepare environments that meet their unfolding physical, mental, emotional and spiritual needs. The environments we prepare for the children significantly influence their behavior. When an environment does not meet the needs of the children and creates obstacles to their normal growth and development they experience frustration and sometimes anger. These seeds are then planted in their sub conscious and come to the surface in the form of aggressive or unethical behavior. It is, therefore imperative that we pay attention to the needs of the children and provide homes and classrooms for them that reflect who they are, encourage them to be independent, recognize their sensitive periods of learning, inspire their intellectual curiosity, provide opportunities to make choices and encourage individual as well as community responsibility. When we prepare environments that meet the above criteria, the children flourish. They are surrounded by caring adults who see them in their strengths and encourage them to be the best they can be. They are immersed in an aesthetically beautiful environment that speaks positively to them every day. 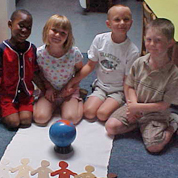 They have a delectable choice of activities that attract and engage them in meaningful learning. They enjoy mastering new tasks and becoming confident and independent. They experience great joy as they learn to respect others and the interdependent elements of the universe. They know that they are responsible for the choices they make and are not victims of circumstance. They appreciate people listening to them as they express themselves and they learn to listen and empathize with others as well. On a daily basis the children in a carefully prepared environment are immersed in positive experiences that result in planting positive seeds of peace in their sub conscious minds. Because of the many positive seeds their sub conscious holds, they most often manifest peaceful, ethical behavior. In our important work as significant adults in children’s lives, we can significantly influence them by doing all we can to live our lives in a mindful manner so we become positive influences in their lives. This can be done through the practice of mindfulness, observation, and self transformation. When we work on ourselves in this manner, we experience the gift of knowing how to create nurturing spaces for our children so their positive seeds flower abundantly. With this flowering comes the revelation of the secret of childhood and its companion caring ethical behavior. 1 Montessori, Maria. The Secret of Childhood. New York: Ballentine Books, 1966, p 19. 2 Hanh, Thich Nhat. Touching Peace – Practicing the Art of Mindful Living. Berkeley: Parallax Press, 1992, p. 25. 3 Ibid. pp. 25 & 27. Sonnie McFarland is a leader in the field of Peace Education. Her background includes more than 30 years as a Montessori teacher and/or Head of School. She currently sits on the American Montessori Society Board, chairs the AMS Peace Committee, presents workshops and consults both nationally and internationally on holistic peace education, including the concepts in her two books, Honoring the Light of the Child – Activities to Nurture Peaceful Living Skills in Young Children and Shining Through – A Teacher’s Handbook on Transformation. She can be reached at shiningmts@aol.com.